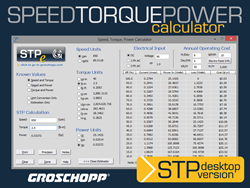 Groschopp's updated speed, torque and power calculator can be downloaded for free to provide easy-access for the user. The program is also capable of determining current, input power, loss, and operating costs based on the motor's efficiency and voltage. Groschopp recently updated the downloadable version of their speed-torque-power calculator. Groschopp Inc., a fractional horsepower motor manufacturer, recently launched an updated version of their STP (speed-torque-power) desktop calculator. The updated program keeps the functionality of the previous version, and are compatible with Windows 8 and Windows 10. What is Groschopp’s STP calculator? Groschopp’s STP calculator is available online in an abbreviated format, and the full desktop version can be downloaded for free at http://www.groschopp.com/technical-resources/about-stp-calculator/. Groschopp, Inc. is an American (ISO 9001:2008) motor manufacturer for OEMs and distributors. Groschopp builds fractional horsepower electric motors, including: AC Induction, Permanent Magnet DC, Brushless DC and Universal. These motors can be combined with Groschopp’s Right Angle Worm, Planetary, Right Angle Planetary and Parallel Shaft gearboxes. Groschopp offers 8,000 standard motor designs and 150,000 possible motor or gearmotor combinations. For more information about Groschopp or their capabilities, contact the sales team at 800-829-4135 or by email at sales(at)groschopp.com.